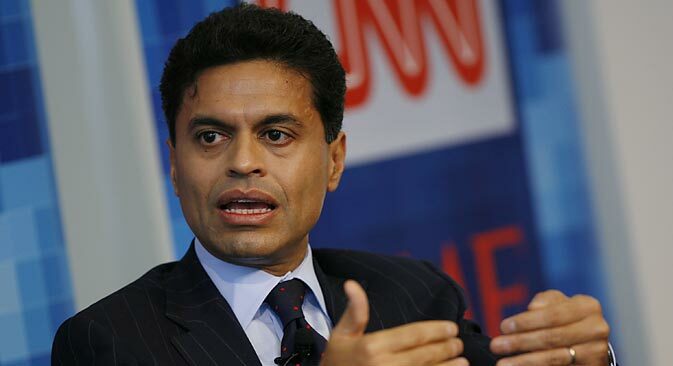 CNN's broadcaster Fareed Zakaria discuss Syria and possible ways of the war scenario. As international negotiations over Syria reach a critical stage, RBTH puts the most pressing questions of the day to writer and broadcaster Fareed Zakaria, the man Esquire called “the most influential foreign policy adviser of his generation”. Russia Beyond the Headlines: Will the agreement on a decommissioning process be enough to prevent military intervention in the Syrian civil war, especially if incontrovertible proof emerges of the regime’s use of chemical weapons? Fareed Zakaria: I believe so. I think one has to remember that the military strikes would have had no impact on the regime’s chemical arsenal. There is a mistaken notion that the strikes were meant to target the chemical weapons; they were not. If chemical weapons are targeted they would, of course, explode releasing toxic gases into the atmosphere. The strikes were to be purely punitive. So ask yourself: what is the most important task here? It is to isolate and perhaps destroy these weapons. The negotiated strategy is much more likely to yield progress on that front. Even if the Syrian government does not reveal everything they have; even if the process is cumbersome and there is a cat-and-mouse game involved, there is likely to be a substantial quantity of the chemical arsenal of the Syrian regime that is isolated and potentially destroyed. That strikes me as a much better outcome if your concern is chemical weapons. Now, of course, there are a lot of people who really do want to intervene in the Syrian civil war and do want regime change and, yes, this negotiated strategy does not address that issue. But if your goal is to do something about these terrible weapons, then I believe this negotiated strategy actually gets you reasonable results, even if it is not fully implemented. RBTH: Similarly, what should happen if the rebels are found to have been guilty of the act? F.Z. : It's a fascinating idea. I have to say that, from the evidence I have seen, I don't believe the rebels are using chemical weapons. I don’t think they have the sophistication or the organisation to use them. One of the problems of the Syrian rebellion is that it is pretty disorganised and somewhat chaotic and very dispersed. So I don't think there is much evidence that they have used them. However, if that were to happen it all the more suggests following the strategy that I am recommending. That is focusing on the issue of getting these chemical weapons out of Syria or under lock and key or destroyed; and being cautious about intervening in the civil war, which is going to be a very messy, complex and multi-year process, no matter whether there is outside intervention or not. RBTH: You seem to be suggesting that, at this stage, it is almost immaterial who used them, and that we need to be moving on from that stage of the discussion. F.Z. : I believe so. Because I think what we have come to now is a fairly mature attitude. The point here is not to punish whoever used them: the more important point is to get these weapons isolated and destroyed. If people are interested in punishing the Syrian regime. . . let's be honest, they are being punished. The US and others are funneling arms, money and all kinds of support to an armed and active insurgency inside the country. The West is not giving foreign aid to Assad; I do realise that the Iranians and the Russians are. RBTH: So far, the West seems to have been pretty selective about which dictators it has sought to remove from power. Should we be aiming for regime change in Syria, and if so why? If we are prepared to relaunch negotiations with Iran, why not Syria? F.Z. : I don't believe we should be following a strategy of active regime change in Syria. Because that means that the US and the West has to bear the consequences of the collapse of the Syrian regime; the potential chaos and anarchy that would involve. We have seen, both in Iraq and Afghanistan, when political order collapses it is an extremely messy process. If you are the one who precipitated that collapse, you are naturally held responsible for it, and then are blamed for everything that goes wrong. It then becomes a potentially decade-long top (and very expensive) priority in your foreign policy. So, I have always thought that the President made a mistake in calling for the ousting of Assad in a casual manner. But I don't believe we can negotiate with Assad in the way we do with Iran. Assad is in the midst of a very brutal suppression of an opposition movement that began as a peaceful opposition movement. The regime has used extraordinary brutality. We know that about 100,000 Syrian civilians have been killed, most of them by the regime; two million have fled. So you can't treat this is a business as usual. I believe the regime is a horrible regime and should go. I think Iran is a very different case. The Iranian regime has not engaged in that kind of brutality and repression. It is a lot more stable than many people have thought. I have said for 10 years that the Iranian regime is not in any danger of collapse. And we have important business to deal with them on the issue of nuclear weapons. So I think that naturally necessitates talking to them. RBTH: Will the fall of the Syrian regime bring about the end of the Syrian civil war? Your anwers so far suggest you think not. F.Z. : I would say it even more definitively: almost certainly it will not bring about the end of the civil war, because we have seen this movie before. The Syrian regime is the third of three great minority regimes in the Middle East. The Lebanese Christians were the first ones to be challenged by a majority: it was a 15-year, messy civil war. In Iraq, we deposed the minority Sunni regime, but they fought back as insurgents and guerrillas: it was a 10-year civil war. And, by the way, it's not over: Iraq is the second most violent country in the world after Syria today. In Syria, you have the third of these historical processes: a minority regime being challenged by the majority. Even if the regime is deposed, I am absolutely certain that elements and supporters of the regime will fight back as insurgents and guerrillas. They have an enormous amount of arms. Remember, the Syrian army is 300,000 strong and very well-trained. So what you will enter into after the deposition of the regime is phase two of the war, which will probably be the massacre of the Alawites. Phase three will be the fight among the various Sunni insurgents as to who is going to win. RBTH: That doesn't bear thinking about, does it? F.Z. : Think back on Lebanon: it was 15 years; it was very bloody. There is a point of war weariness at which political deals become possible. I think what the US has to do is wait for that opportunity, push hard on the diplomatic front, and try to get some kind of deal. In the meantime, all we can do is help on a humanitarian level much more than we are doing; try to bolster countries like Jordan, Lebanon and Turkey which are being battered by this. But the idea that we could, with the interventions we are talking about - a few days of missile strikes - have any impact on what is this deep, deep, violent churning that is taking place in Syria is, frankly, entirely ahistorical. RBTH: To use a poker metaphor, Mr Putin seems to have played his hand cannily throughout. Is it time for Russia to lay its cards on the table? And are we seeing the re-emergence of Russia as a major player in the high-stakes global game? F.Z. : Putin has played his hand very well, there's no question about that. He took advantage of a certain incoherence in American foreign policy towards Syria. Towards post-conflict Syria: Which way is right? The US had multiple goals and was stating them almost seriatim, without any sense of priority. He [Putin] picked out one and said if you are really concerned about chemical weapons, then here is the solution. He forced some clarity on the US administration. In effect, the US had to pick between regime change and the international norms that they were trying to uphold. So in that sense he has been very canny. Putin has long wished that he and Russia play a larger role on the world stage in precisely this way: as a force that is thwarting what he sees as a rampant American hegemony in a kind of global management of the world. As to your larger question of whether this reflects the return of Russia on the world stage, I would be somewhat cautious. Ever since the collapse of the Soviet Union, Russia has not played a very large role on the world stage, largely because it has collapsed as a great power. It does have a big army, but if you think about it, despite all the things that have happened since the fall of the Soviet Union, so many different breakaways of republics and such, there is only one case in which they used the Russian army, and that was the case of Georgia - which is a very particular one where there is a [significant] Russian minority living there. RBTH: Finally, can you offer your best and worst-case case scenarios for the short term? F.Z. : I think the best-case scenario is that in three or four months, the inspectors are in Syria; they are checking and isolating certain important caches of chemical weapons. They are probably not all of the weapons: the regime is probably hiding some. But there is some significant progress and you are getting a regime that always denied even having these weapons to admit to them, identify them, take the inspectors to them and have them placed under control, perhaps destroyed. The worse case scenario is that the whole thing collapses; that there is so much obstruction that it, in effect, calls America's bluff about the use of military force. Then, of course, it would not be a bluff; the US would have to use military force to follow up on its words - which I think is unwise. I think Robert Gates, the former defence secretary, put it very well. He said it would be like throwing gasoline on a fire and watching and wondering what will happen. It's not that I don't want to punish the Syrian regime; it's just that it feels as though you are escalating in a very volatile situation without a clear strategy. Military force is not an instrument of communication; it is an instrument of compulsion. You use it when you want to thoroughly defeat the other side. You don't use it to "send a signal". To do that we have diplomacy and email. What's your opinion on the Syrian crisis? Do you agree with Zakaria? Share your opinion in the comment section below!